Our Pocket Rockets program is custom-made for active, energetic and bold kids that are always on the move. We don’t believe in gendered stereotypes and keep our class themes and imagery gender-neutral. Our Pocket Rockets don’t have to worry about being pretty in pink if they feel like being brilliant in blue! WHO SAID PRESCHOOL DANCE CLASSES WERE ALL ABOUT FAIRIES AND PRINCESSES? Your little mover and shaker will jump, leap, run, skip, twist and tumble their way through a fast-paced lesson filled with dynamic activities that will leave them soaring. 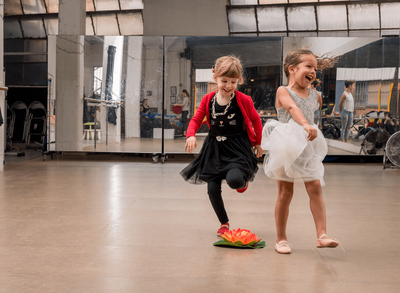 A mix of jazz, ballet, hip hop and tumbling will introduce your little one to a full range of movement possibilities and really keep them on their toes. Your Pocket Rocket will develop confidence like you’ve never seen before, increase their coordination, and unleash their creativity in every action-packed class. But more importantly, belonging to the Pocket Rockets will cultivate a lifelong love of learning in your little one. Every child is different, so why stick to a confining ‘one-size-fits-all’ approach to teaching dance? We appreciate the unique differences of each and every child allowing them to develop a distinctive sense of self as we guide them to explore movement and music in their own way. The job of a child is to learn through play, so we’ve embedded our valuable learning outcomes into a sequence of carefully planned and fast-paced lessons that will stimulate their senses and push their imagination into hyperdrive. Our program is broken up into three levels that cater to the developmental needs during the stages of early childhood development. OUR TIERED PRESCHOOL DANCE CLASSES OFFER DIFFERENT LEVELS OF POCKET ROCKET POWER EVERY WEEK! Developed by a doctoral researcher in dance pedagogy and teacher practice, each class is carefully crafted to ensure students develop vital physical, cognitive and social and emotional skills, all the while celebrating and cherishing the joy and vibrancy of childhood. As your child grows with us, they’ll feel a sense of accomplishment and pride as they progress through the Pocket Rocket levels. Beginning on the Launchpad, they’ll develop crucial fine and gross motor skills. 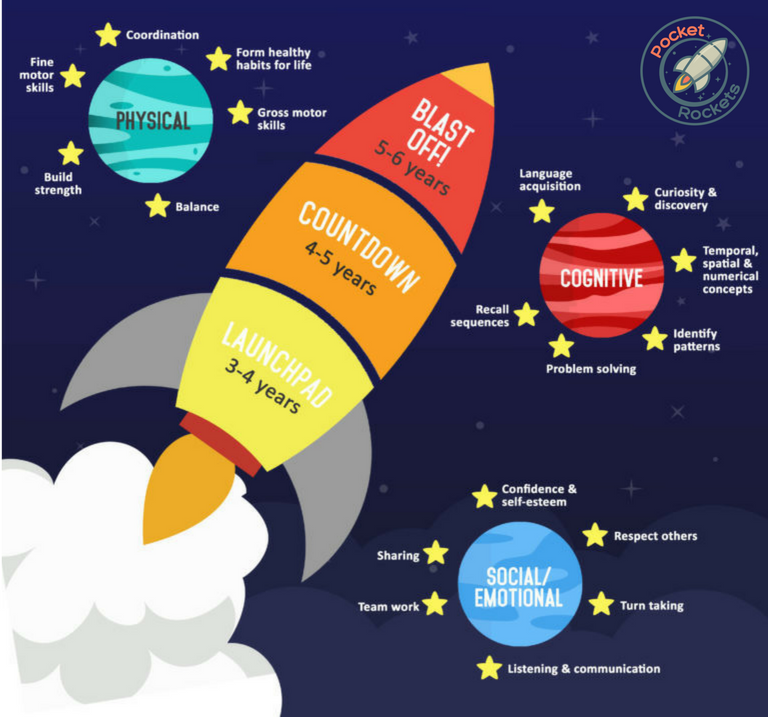 They’ll then boost up to Countdown phase, where fun exercises will increase their understanding of concepts such as time, space and numbers. And before you know, they’ll be ready to Blast Off! Their confidence and self-esteem will soar week after week and they’ll be ready to take on the world… or the universe! Who said preschool dance was all about fairies and tea parties? Our Pocket Rockets program is dance done different for cool kids that need to move. 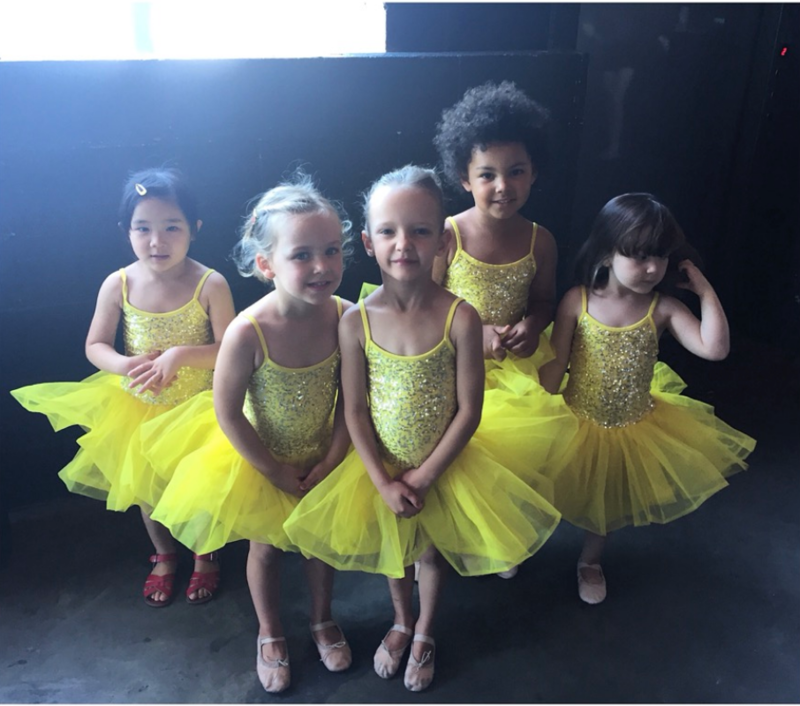 With a little jazz, ballet, hip hop and tumbling, our classes are the perfect introduction to movement for your littlest dancer. Don’t see a time that suits? Then get in touch to register your interest for another day/time. Fill out our enrolment enquiry form to select your desired class, and we’ll send you a link to our portal to complete your registration in just a few minutes. We’ve tried dance classes before, but we didn’t really like it. Is this really that different? Yes! We don’t believe in Toddlers and Tiaras or Dance Moms type classes. We’re down to earth, bright and full of energy. As soon as you step into the studio, you’ll see that we’re a different kind of dance studio – from the kids’ paintings on the wall, to the chill out area for students, and the comfy couches for parents – this is a place where you’ll feel at home from the very start. Can you accommodate different abilities? We appreciate the unique differences of every child and believe that anyone and everyone should be able to benefit from dance. If you have concerns or would like to discuss the needs of your child further and how we can give them the best experience possible, then just get in touch with us! There are no mandatory tutus or dresses here. Don’t want to wear pink or purple? No problems! Our Pocket Rockets are free to dress to express themselves as they see fit. We recommend comfy clothes that kids can move about in, such as a leotard or top, and either shorts, leggings or a skirt. Of course, if your little one loves nothing more than getting dressed up in a tutu for class, that’s cool too! What ages are the classes for? Our Pocket Rocket program is tailor-made for ages 3-6. Keeping the developmental needs of our littlest students in mind, we have carefully crafted three different stages of action-packed dancey fun! Our classes are conveniently located in the inner west at our purpose-built St Peters studio. Located at Studio 4, 1-7 Unwins Bridge Rd, we share the same complex as the Sydney Rockclimbing Gym and Trapeze School. Head in the driveway, follow the ramp down and turn right. There’s plenty of parking too and a café on-site too! Should I stay during the class? Some schools don’t allow parents to watch during classes, other schools ensure that parents stay. We say – “whatever works for you works for us!” Some children are able to get more out of their class times when they’re not able to see their loved ones… others are more relaxed knowing that they’re around. Feel free to talk to your class teacher if you are unsure! A lot of our Pocket Rocket parents love to drop their children off, see them start off the class, then duck to the on-site café for a moment of quiet time before they return for the end of the class. I really want to join, but we can’t make these class times! Then get in touch! If we have enough interest, we may be able to set up another Pocket Rocket class. Among our curriculum resources, we’re delighted to be an affiliate Leap ‘N Learn studio. Leap ‘N Learn is an effective, safe, progressive, and developmentally appropriate dance program for creative movement to beginning ballet. Designed by master teacher Beverly Spell and expert child psychologist Dr. Annie Spell, the curricula combine the healthiest practices for teaching children ballet technique, while simultaneously encouraging pretend play amongst the youngest students to maintain a positive and nuturing environment. Want to know more about what the Pocket Rocket revolution can do for your child? 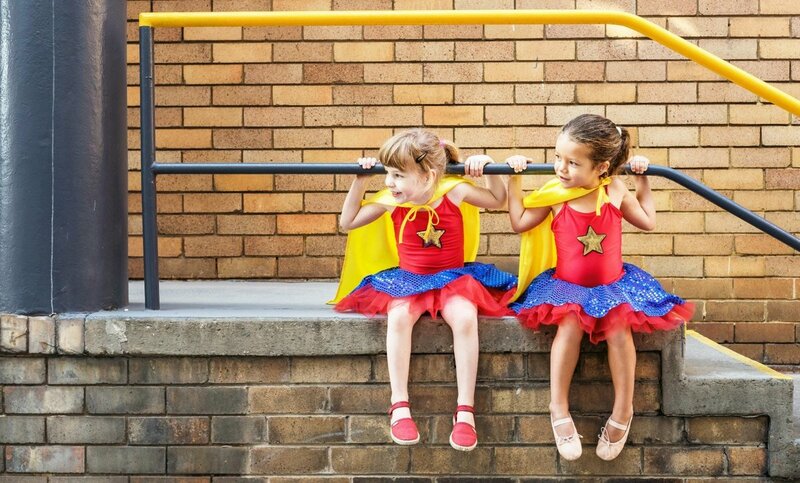 Feel free to email hello@dancedomain.com.au to speak with the director about what makes our preschool dance classes different from the rest. We’ve taken the fuss and fluff out of preschool dance classes. Gender-neutral, energetic, and bold – we let kids be kids and encourage them to unleash their potential and develop a unique sense of self.